Founded in 2003. Changed name from Copper Dragon to Greyhawk in 2014. 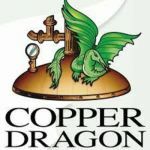 In 2018 the Greyhawk name was changed back to Copper Dragon and now cuckoo brewing at Camerons.